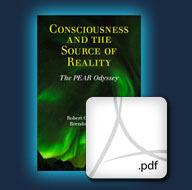 Prologue to Consciousness and the Source of Reality. Click to read or download. Preamble to Margins of Reality. Click to read or download. "The PEAR Proposition" trailer. Click to watch larger version. These materials provide a more in-depth and contextualized look into the Princeton Engineering Anomalies Research (PEAR) program. When Robert G. Jahn and Brenda J. Dunne first embarked on their exotic scholarly journey more than three decades ago, their aspirations were little higher than to attempt replication of some previously asserted anomalous results that might conceivably impact future engineering practice, either negatively or positively, and to pursue those ramifications to some appropriate extent. But as they followed that tortuous research path deeper into its metaphysical forest, it became clear that far more fundamental epistemological issues were at stake, and far stranger phenomenological creatures were on the prowl, than they had originally envisaged, and that a substantially broader range of intellectual and cultural perspectives would be required to pursue that trek productively. This text is their attempt to record some of the tactics developed, experiences encountered, and understanding acquired on this mist-shrouded exploration, in the hope that their preservation in this format will encourage and enable deeper future scholarly penetrations into the ultimate Source of Reality. 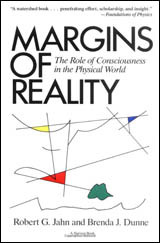 This pioneering work, which sparked intense controversy when it was first published two decades ago, suggests that modern science, in the name of rigor and objectivity, has arbitrarily excluded the role of consciousness in the establishment of physical reality. Drawing on the results of their first decade of empirical experimentation and theoretical modeling in their Princeton Engineering Anomalies Research (PEAR) program, the authors reach provocative conclusions about the interaction of human consciousness with physical devices, information-gathering processes, and technological systems. The scientific, personal, and social implications of this revolutionary work are staggering. 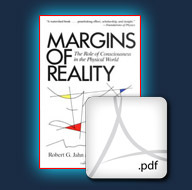 MARGINS OF REALITY is nothing less than a fundamental reevaluation of how the world really works. 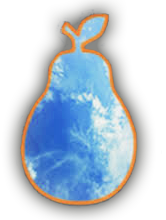 As an important element of PEAR's transition program, we have recently prepared a comprehensive educational DVD/CD set entitled "The PEAR Proposition." 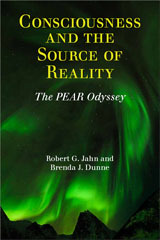 Two DVDs offer the viewer a synopsis of the program's history; a virtual tour of the PEAR laboratory; four lectures by Professor Jahn; informal commentaries by staff members, interns, operators, and friends; an assortment of downloadable PEAR publications; and sundry interstitial material that attempts to capture the spirit and substance of the PEAR enterprise. An audio disk records a conversation between Bob Jahn and Brenda Dunne in which they talk about the interpersonal dynamics that have characterized the program, and share their perspectives on the interpretations and implications of the research results.